Children and adolescents should supplement vitamin K to benefit from its bone health properties, according to a new study published in Nutrients. The research which looked at the vitamin D and K status in children with and without low-energy fractures, found that there was a correlation between increased levels of vitamin K2 and reduced rates of low-energy fractures. There are many risk factors that contribute to this growing health concern, including deficiency or insufficiency in nutrients, including calcium, vitamin D and vitamin K2. The author of the study highlighted the role of vitamin K2, especially menaquinone-7 (MK-7), in the literature and distinguished it from vitamin K1, in maintaining calcium homeostasis and a healthy skeletal system. It is difficult to get optimal amounts of vitamin D and K2 in a typical modern western diet. To obtain enough K2 from diet alone, you would have to eat around 200 g of cheese every day to reach the recommended 75 ug a day. Up that to over 3 kg to get the recommended 10 mcg (400 IU) of vitamin D advised throughout autumn and winter by Public Health England. It’s a fact that supplementation is increasingly required to guarantee we are reaching optimal levels of these essential nutrients, but tablet supplementation can prove problematic for children. Natural health company BetterYou has developed a Vitamin D + K2 Oral Spray to support optimal bone health, bringing together vitamins D3 and K2 to help put calcium in balance. Combined in a peppermint flavored formulation, D3 and K2 work together to help transport calcium into the bone where it is needed and improve density. The formulation offers superior nutrient delivery though the inner cheek of the mouth in just three simple sprays – ideal for administering to children. The spray contains a form of vitamin K2 (MK-7) derived from a flower source, which is more pure and stable than forms currently used in the marketplace. Peak bone mineral density is reached during your mid-twenties. After the age of 35 bone loss increases gradually as part of the natural aging process. This means the more you can do to build bones early in life, the better your bone health will be in later years. Three daily sprays of BetterYou DLux+ Vitamin D+K2 provides 3000 iu of Vitamin D and 75 ug of Vitamin K (100% of the RDA). One bottle provides a month’s supply. An oral spray doesn’t need to be taken with food or water and can be easily used on the go. It can be taken at any point in the day as it avoids the digestive system completely. 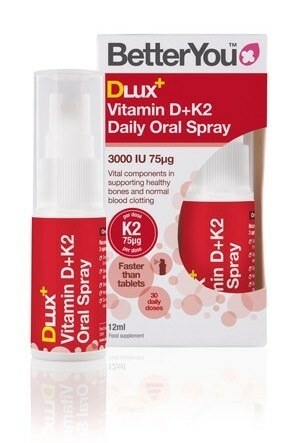 BetterYou DLux Vitamin D+K2 Oral Spray is available from Holland and Barratt, Ocado, www.betteryou.com and all good health stores.